opening between 6 and 10pm. The exhibition I Will Never Talk about the War Again will be presented for the first time in Slovenia as a part of the programme created by KIBLA for the manifestation Maribor 2012: European Capital of Culture. The exhibition has been produced by KIBLA and Biro Beograd, with the support of the Ministry of Education, Science, Culture and Sport of the Republic of Slovenia, Maribor 2012 – European Capital of Culture and the Municipality of Maribor. The title of the exhibition is borrowed from the video performance I Will Never Talk about the War Again, by two artists from Sarajevo, Adela Jušić and Lana Čmajčanin. For their recent sound installation piece Bedtime Stories they collected stories about life during the 1395-days’ siege of Sarajevo, when people sought shelter from grenades in the small basement quarters of the city’s buildings. Adela Jušić/Lana Čmajčanin: I Will Never Talk about the War Again, video still, 2011. Adela Jušić/Lana Čmajčanin: Bedtime Stories, installation, Färgfabriken, Stockholm, 2011. During the last decade, several attempts to organize Gay Parades in Belgrade and Zagreb failed, while those „successful ones“ have been held under heavy police protection. In Belgrade in 2001, groups of fascists, clerical nationalists, and football hooligans attacked the parade and a large number of people were injured. In his two-channel video installation East Side Story Igor Grubić, an artist from Zagreb tackles the question of the rights of sexual minorities in societies that show a violent reaction to any diversity. Igor Grubić: East Side Story, photo, 2008. 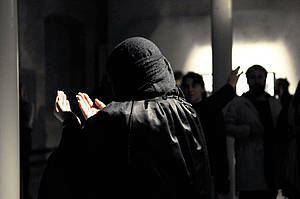 With her continuous performance Holy Warrioress, one of the most radical artists from Sarajevo, Alma Suljević, challenges the Islamophobic condition of Western societies and reminds us of the consequences of such hostilities, having herself witnessed the war in Bosnia and the genocide of Bosnian Muslims. 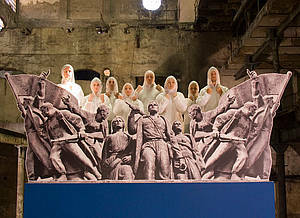 Alma Suljević: Holy Warrioress, performance, Färgfabriken, Stockholm, 2011. Shadow Museum presents the re-enactment of the performance I Slept Under the Photos of Killed in the Wars in former Yugoslavia by Jaroslav Supek, an artist from Vojvodina, Serbia (1952-2009). The artist has taken the responsibility instead of being silent. His message is universal and concrete, it is true and obvious. 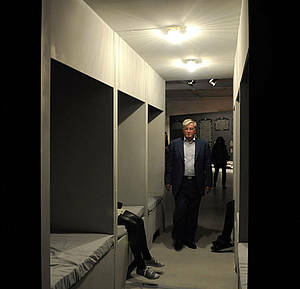 Shadow Museum/Jaroslav Supek: re-enactment of the performance I Slept Under the Photos of Killed in the Wars in former Yugoslavia by Jaroslav Supek, Färgfabriken, Stockholm, 2011. In his newest mural The Years of the Bonecrusher Queen, Nikolay Oleynikov, an artist from Moscow, develops a menagerie of situations and images connected to the historical chronology of war-related events in the former Yugoslavia. He also throws a new light on the sinister role of the international actors in that war. The new mural-installation will be realized specifically for the exhibition in Maribor. 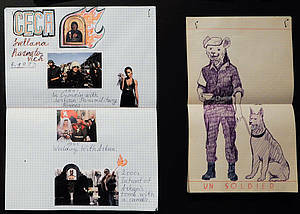 Nikolay Oleynikov: The Years of the Bonecrusher Queen, fragments, Färgfabriken, Stockholm, 2011. The film Partisan Songspiel: Belgrade Story is the second in a series of the Russian artists collective Chto Delat? songspiels. Staged in an abandoned factory from the 19th century, it refers to actual events in Serbia in the year 2009, and transposes them into a more universal songspiel about oppressors and oppressed. Chto Delat? : Partisan Songspiel: Belgrade Story, production still, 2009. I will Never Talk About the War Again is modified version of the initial exhibition presented in 2011, as a collaborative effort of Biro Beograd and Center for Art and Architecture from Stockholm Färgfabriken, under the title „Psychosis 1 – I will Never Talk About the War Again“. Vladan Jeremić (b. 1975, Belgrade) is a curator and artist who lives and works in Belgrade, Serbia. In his curatorial and artistic practice he researches the intersection between contemporary art and political activism. He works together with Rena Rädle as an artist duo. They founded Biro Beograd, an association that provides a platform for critical practice that goes beyond conventional forms of contemporary art, cultural and social research, or political activism. between 9am and 10pm, and closed on Sundays.